Thanks to the efforts of Englewood Hospital’s staff of cardiology experts and its reputable surgical infrastructure, it was able to become a major center to offer TAVR to high-risk patients who have severe aortic stenosis or who are not considered ideal candidates for open-heart procedures. Since then, Englewood Hospital has performed the procedure on 250 of these patients. Initially, the manufacturer of the TAVR device was very conservative in identifying centers with which it wanted to be involved. “They were rolling the device out in a very particular way, where they wanted the proper operators and a specific surgical setup. We fit the bill,” said Joseph De Gregorio, MD, section chief, invasive cardiology at Englewood Hospital and Medical Center. Since TAVR was introduced at Englewood Hospital, the program has grown dramatically each year. The heart team performed more than 100 TAVR cases in 2016 and expects substantial growth in 2017, especially since the FDA has approved the device for intermediate-risk patients in addition to the high-risk patients for whom it was already approved. “That expanded the procedure tremendously,” Dr. De Gregorio said. 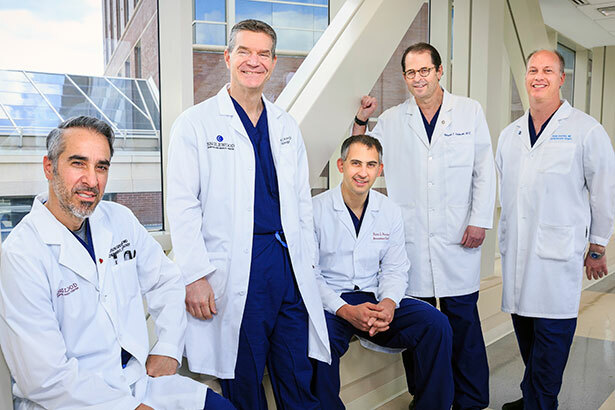 Englewood Hospital’s cardiac surgeons and cardiologists have observed a high success rate in TAVR patients, with outcomes better than the national average. Dr. De Gregorio attributes this success to the multidisciplinary approach. With their TAVR program well underway, the team is now set to embark on their next project: the MitraClip. “That’s expanding the transcatheter structural heart therapeutics to the next level,” Dr. Arnofsky said. “This is the first procedure that’s been FDA approved to correct mitral valve abnormalities in high-risk patients who are not candidates for an open procedure. We have performed several MitraClip procedures so far. Another technological development is an absorbable coronary stent. Dr. De Gregorio was one of the investigators involved in a three-year-long clinical trial of the stent, which was approved by the FDA last year. “When people have blockages in their coronary arteries, we’ve historically used metal stents that act as scaffolding to open up the area blockage. But those stents stay in forever. The artery grows around it, and the stent becomes embedded, a permanent part of the arterial wall,” he said. These new stents, which are made of polylactic acid, start to be resorbed by the body at six months. By the end of three years, they are often completely resorbed. “The basis of this is that by six months you wouldn’t need a stent anymore because the artery has healed in an open position,” Dr. De Gregorio said. “Englewood was one of the few centers involved in the trial, and we can now offer that procedure. If we can make a resorbable stent that’s as easy as the metal stent in terms of usability, we’d be better off using the resorbable stent. We don’t like to leave things behind; we like arteries to return to their normal state.” It is possible that future generations of the resorbable stent could replace metal stents in most situations, he added. Dr. De Gregorio, now in his 11th year as co-director of the annual Complex Interventional Cardiovascular Therapy (CICT) meeting, an educational conference dedicated to discussions of structural and interventional therapies, gave a presentation on the absorbable stent at the meeting, which took place at the end of July in San Francisco. Although open-heart surgeries are common, Englewood Hospital and Medical Center is committed to providing less invasive options. One such option, transcatheter aortic valve replacement (TAVR), allows physicians to repair an old or damaged valve without actually removing it. Another, endovascular aneurysm repair (EVAR), involves making a small incision in one or two arteries in the groin and inserting a catheter to guide a graft into the aneurysm. The benefit of this procedure is that there is no need for abdominal surgery, and it has fewer associated risks and a short recovery time. A TAVR procedure may become more complicated if a patient has an aneurysm that requires intervention from a vascular surgeon. This is where Englewood Hospital’s multidisciplinary approach comes into play. The seamless coordination between Englewood Hospital’s cardiac and vascular surgeons allows for smooth handoffs of those patients who require additional interventions. An advanced and minimally invasive technology that has come out of this process is fenestrated EVAR grafts, which give vascular surgeons the ability to navigate and fix aneurysms while maintaining the integrity and structure of the valves and veins. This is an advanced technique, and with fenestrated grafts, more patients with different anatomies can be treated, as the devices can fit almost all patients. Fortunately, the cardiac and vascular surgeons at Englewood Hospital can decide the best course for individual patients with abdominal aortic aneurysms and which of the two types of EVAR procedures (standard and complex) they should receive.